For Muslims living in Muslim-majority countries or even neighborhoods, their daily lives are now filled with helpful reminders that they are in the midst of Ramadan, the holiest month on the Islamic calendar. Because of the requirement that Muslims fast from the first light of dawn until sunset, certain practices are incorporated into the daily activities. For instance, in many areas, the call to prayer–broadcast over the loudspeaker from the local masjid–signals the moment when the fast can be broken in the evening (iftar) or when the early morning meal (suhoor) can be eaten before the sun rises. In some more compact Muslim-majority cities, a cannon may even sound to mark the moment when the fast may be broken. Throughout the cities, many shops and restaurants are closed during the daytime, and those who are not fasting usually abstain from eating or drinking in public. What food is available in the streets and shops is usually special food that Muslims enjoy during the evening Ramadan meals. In addition, many people spend more time at home if they do not need to work, and it is common for people to spend time together with family members and friends, watching special Ramadan programming on TV. Living in these contexts with the regular reminders of the holy month, can make it easier for Muslims to maintain the fast and to feel supported by others in the religious community. On the other hand, for converts to Islam who do not have Muslim family members and friends or for those who live in a Muslim family but in a Western country, Ramadan may present more challenges, especially when those around you are not fasting. More and more in these situations social media have become invaluable in providing a supportive community during the holy month, practical information about when to break the fast, advice on fasting, religious inspiration, and a sense of connection among Muslims. Twitter acknowledged the increased use of social media during the Islamic holy month, and this Ramadan, which began on June 28, the social networking site launched several special campaigns for the month. First, they created special “hashflags” so that when you tweet #ramadan, a crescent moon icon will appear and when you tweet #eid, an icon of Arabic calligraphy will show up in your tweet. Twitter used a similar campaign during the World Cup but with icons of national flags. 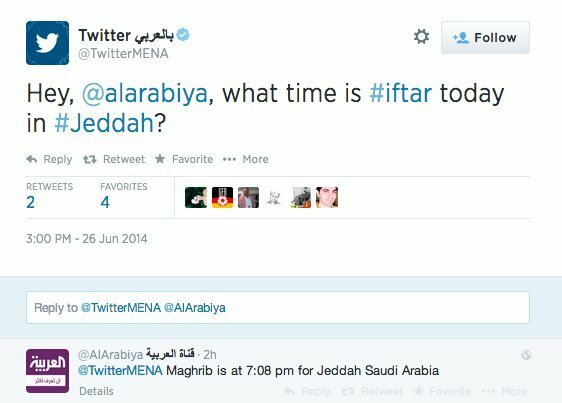 In addition, the Twitter handle for the media company @AlArabiya will send personalized iftar and suhoor times if you tweet your location to them. This provides a useful service for Muslims who live in areas without close-by masjids or Islamic centers. It is likely that Twitter will be a popular place for Muslims to share their thoughts, prayers and words of encouragement during Ramadan. 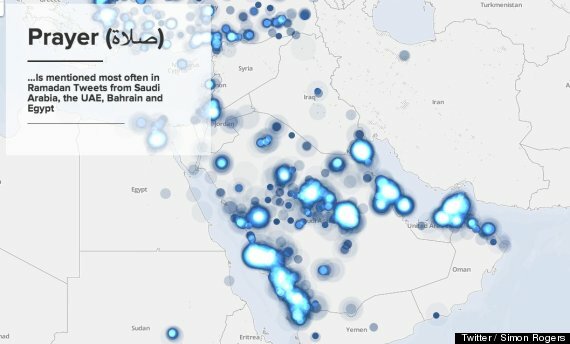 Last year over 74.5 million tweets were sent out about Ramadan, as can be seen in this interactive map created by Simon Rogers. The map illustrates the areas of the world with the most activity and the topics of conversation within the tweets. Interestingly, “happy” is frequently used in tweets coming out of the U.K. and Malaysia, but “hungry” and “thirsty” are used often in the North American tweets. Another recent article explored some of the positive messages that have been posted on social media by non-Muslims who want to encourage and support Muslim friends. On YouTube as well, Ramadan is a time when many popular Muslim YouTubers create special series of videos, similar to the practice within Muslim-majority countries of TV channels broadcasting special programming during the month. Since Muslims tend to spend more time at home during Ramadan, special TV programs or YouTube videos offer entertainment, as well as practical tips and information. For example, two popular Muslim women on YouTube, Amenakin and Nye Armstrong, are filming special videos during the month with advice on the holy month but also more light-hearted videos about topics like recipes and fashion. Nye Armstrong is also running a special fund-raising campaign during the month to raise money for Qur’an Weekly, an organization that produces educational videos about Islam. In an introductory video to her special Ramadan series, Nye enthusiastically details all the special videos that she will be creating during the holy month. She also indicates that she understands, as a convert, how Ramadan can be somewhat lonely when you don’t have a community with which to celebrate. She says in the video, “For years, I was alone during Ramadan. My hope is that this channel will be sort of like a hub for you to come hang out, and just a place for you to feel welcome.” These special video series indicate the important role that social media can play for Muslim during Ramadan by creating a space where Muslims can gather and feel a sense of connection. 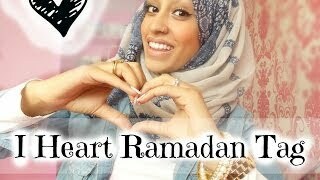 http://www.youtube.com/watch?v=pI3CGbb1-94 Another recent trend among Muslim women on YouTube is the “I Heart Ramadan” tag videos. British YouTuber, Bubblegum Hijab, started this tag in which videomakers answer a series of questions about Ramadan, such as: What are your family traditions during Ramadan? What are your favorite Ramadan foods? What are your favorite/least favorite aspects of the month? What are your tips for fasting? Bubblegum Hijab said that she was looking for videos on YouTube that expressed excitement over the upcoming holy month in a similar way to other videos about Western holidays like Christmas. 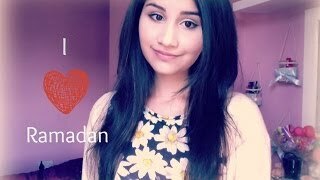 As she was not able to find a lot of videos about Ramadan, she decided to create her own tag video and invite her fellow YouTubers to participate. So far over 20 other Muslim women from different countries have created and posted their own videos. These videos both provide practical tips and information on Ramadan, but they also allow Muslims to get excited about the holiday and to take pride in their religious and cultural traditions. In the videos, the women discuss family memories and traditions for the month of Ramadan. The women are able to both take pride in the religious traditions that all Muslims share but also the cultural traditions that vary, depending on their ethic backgrounds. So one women who is Latina discusses breaking her fast with tamales and another who is Bengali British talks about eating chana and samosas during iftar. Most of the women discuss the spirit of the month and the positive feelings, as the whole family gathers together for meals each evening and then stays up late talking and socializing. Some of the videomakers are converts and discuss their memories of their first Ramadans. Similarly, a lot of the women who were born Muslim share memories of the first time that they were able to fast as children. Both groups talk about the excitement of being able to fully participate in the holy month and to feel like a complete member of the religious community. The videos also feature some tips and advice for fasting, but most of the women emphasize the importance of maintaining a focus on the reasons for the fast. They encourage viewers to not think about the hunger and the thirst, but to focus on the religious aspects: the obedience to God, the spiritual rewards of fasting, the importance of prayer and good deeds, and the reminder of those people who have no choice but to live without enough food. The “I Heart Ramadan” tag videos, along with other social media efforts during Ramadan, provide Muslims with a space in which they can both connect with other Muslims and express pride in their religion and the traditions of this holy month. Muslims living in Western countries may not feel the spirit of Ramadan when they walk around their city and non-Muslims are going about their regular business, but Muslims can find a supportive community of other Muslims online. In addition, more and more companies, such as Twitter, are beginning to acknowledge the important role that social media play in the lives of Muslims during Ramadan.